You've come to the right place if you're looking for the best mulling spices. 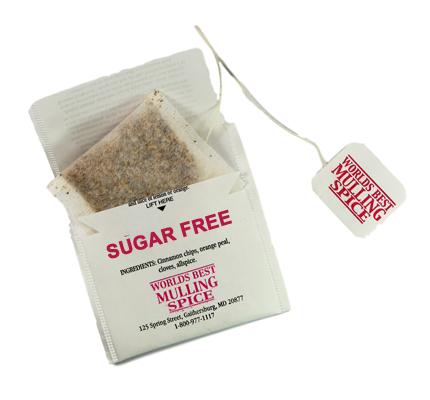 We have one of the largest selections of mulling spice products and we cater to retail buyers as well wholesale buyers. Olde Tradition Spice, Inc., reaches out in the community by employing Americans with disabilites to pack the mulling spices into each box. They also package the cinnamon sticks, mulling spice whole pieces, apple pie, pumpkin pie, pumpkin apple crisp and sample bags. They put pride into their work and are proud to earn a paycheck for the work they do. We are also proud of the fact that this helps to provide jobs for Americans and your support helps make this a reality. Becoming a registered Olde Tradition Spice Distributor is a great way to introduce our products to your community as well as earn extra income. Call us at 1-800-977-1117 for information about how you can easily become an Olde Tradition Spice distributor. Click here to access our Wholesale Orders webpage if you are already a registered Olde Tradition Spice Distributor. Sorry, access is restricted to registered distributors. If you don't see what you want, then pick up the phone and give us a call. We're sure we can help you find it. Meanwhile, enjoy your visit and imagine the aroma of mulling spices in your own home!